When American doctors enter the field of medicine, most take an oath to put the patient’s health as a top priority. But some doctors and hospitals say they are concerned that Missouri’s sudden legalization of medical marijuana raises questions on how doctors should prescribe the drug to patients. The Constitutional amendment that passed included a list of conditions that can be legally treated with marijuana. But medical professionals say there are many questions going forward—including whether it’ll be beneficial for a given patient and how much is safe to prescribe. “That’s one of the problems we had with the passage of the amendment that would legalize medical marijuana, because there’s a big dosage problem with it,” said Jeff Howell, the director of government relations for the Missouri State Medical Association. Howell says doctors can’t dose marijuana like other prescription drugs. 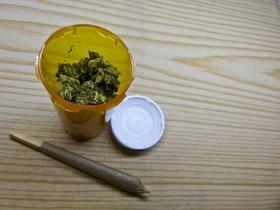 He also said it may be difficult for doctors who have no prior knowledge on prescribing marijuana. “Physicians don’t have training in recommending medical marijuana and there’s been no significant studies done because the DEA classifies it as a Schedule 1 controlled substance. And when you’re on a Schedule 1 controlled substance, you can’t undergo peer reviewed clinical testing—so there’s not a lot of knowledge out there," Howell said. According to the United States Drug Enforcement Administration, drugs classified as Schedule 1 have a "high potential for abuse." Amendment 2 says patients in Missouri must receive a recommendation from a physician—supporters call this a "certification"—before they can get marijuana through state-approved dispensaries. The Missouri Department of Health and Senior Services is the agency tasked with implementing and regulating the new law. Howell says he thinks this will include dosage rules and requirements. Local hospitals are looking over their procedures, too. "In light of yesterday’s election results, CoxHealth staff will begin developing protocols that account for changes in Missouri law regarding marijuana use in outpatient treatment. After the law takes effect, it will be up to physicians to weigh pros and cons for its use before writing a prescription, as is the case with any medication." And Sonya Kullman, a spokeswoman for Mercy Hospital in Springfield, said it would be premature to make a statement on the matter at this time. KSMU requested an interview with the Missouri Department of Health and Senior Services, but the agency did not respond by deadline. A staff member in the director’s office said the department was inundated with calls requesting information on the new law. Missouri voters approved a sweeping overhaul of state legislative redistricting, raising the minimum wage and legalizing medical marijuana, but rejected a gas tax increase. Of all of the initiative petitions on Tuesday’s ballot, the most contentious was Clean Missouri — on the ballot as Amendment 1. Voters approved it by a wide margin — 59-40, with close to 60 percent of the votes reported — a result propelled by a well-organized and well-funded campaign. Passage is a huge victory for Democratic activists seeking to advance their party’s state House and Senate prospects after the next census.